One Cause of Red Eye – Subconjunctival Hemorrhage | Visionary Eyecare's Blog: "The Eye Journal"
This is a very frightening looking condition affecting patients. They come in with a red eye – like a bright red blood patch on the white of their eye – but, there is no pain, discharge or blurriness to their vision. Sometimes the eye may feel a little bit “scratchy” or irritated but, that is usually rare. Sometimes they are caused by trauma to the eye but, most of the time they occur without any injury sustained to the eye – they just seem to appear “out of nowhere”. 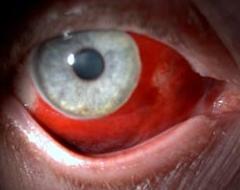 It is called a Subconjunctival Hemorrhage – or “Subconj Heme” for short. 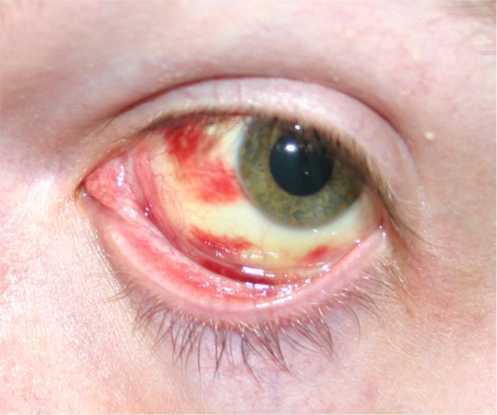 It is caused when one of the tiny blood vessels on the white of your eye ruptures and that tiny drop of blood gets trapped between the white of your eye (the sclera) and the clear skin that covers the sclera (called the conjunctiva). Sometimes this blood vessel breakage can be caused by a strong cough, vomiting, lifting something heavy, constipation strain, a stong sneeze etc. This “trapped” blood usually takes about 7-14 days to clear up. It is sort of like a bruise under the skin (but here the “skin” is the clear conjunctiva)….first the color is red and bright then over time it may turn different colors over time and become a bit yellowish before it completely clears up. If you are on a “blood thinning” medication – it can cause the blood vessel to take a longer time to stop bleeding and a small blood spot can quickly become a much larger one due to the delay in clotting. Many times a patient may be taking aspirin, coumadin or warfarin (these are blood thinning oral medications) or some type of herbs that can cause cause blood thinning and bleeding risks like St John’s Wort, Cayenne Pepper, Garlic, Ginger and Ginkgo. People with high blood pressure and/or diabetes can also be at higher risk for developing a “Subconj Heme”. It is always a good idea to go to see your eye doctor if you have a red eye and think you may have a subconjunctival hemorrhage. Many red eyes look alike and the doctor can tell you if you really have a subconj heme or if the redness is being caused by an eye infection or other serious condition. If it is a subconj heme then the doctor can determine if you need to be sent for further investigation of possible blood/bleeding disorders. This entry was posted in Eye Health, Red Eye and tagged Aspirin, Bleeding Disorder Eye, Blood Disorder Eye, Blood in the Eye, Blood on White of Eye, Blood Sclera, Blood Thinners, Blood Thinning, Bruise on Eye, Cayenne Pepper, Conjuncitva, Coumadin, Dr Anna-Kay Tenn, Dr Bearden, Dr Dawn Bearden, Dr Emily McCulloh, Dr McCulloh, Dr Tenn, Eye Exam, Eye Redness, Garlic, Ginger, Ginkgo, High Blood Pressure, Hypertension, Irritated Eye, Red Eye, Red Eye Constipation, Red Eye Coughing, Red Eye Sneeze, Red Eye Vomit, Red Sclera, Redness in Eye, Redness of White Of Eye, Sclera, St John's Wort, Subconj Heme, Subconjunctival Hemorrhage, Trauma to Eye, Visionary Eyecare, Warfarin. Bookmark the permalink. thanks doc!! but is there any treatment for this disease? Well, this is not really a disease – it is a condition that happens when a blood vessel leaks blood inbetween the sclera (the white of your eye) and the conjunctiva (the clear skin over the sclera). It is always best to have an Eye Doctor take a look at your eye first. In most cases – it will just go away on its own in a few weeks – similar to a bruise under your skin. If you are feeling irritatation – you can try using artificial tears (lubricants) like Refresh Tears – every few hours. I hope this helps and let me know if you have any other questions!! Is there anyway to stop the bleeding? I have this for 2 days and within these 2 days, the redness spread and it doesn’t seem to stop bleeding. Sometimes the redness spreads out in the first day or so. Its best to go and see an eye doctor and have them take a look at it to make sure it is nothing serious. I’ve been getting these sporatically for no apparent reason. I can tell you with assurance that I’ve not been straining, lifting heavy things, coughing or sneezing, and I don’t have high blood pressure or diabetes. I do however have a “mild” brain injury. It came to my attention 8 months ago when I was diagnosed with complex partial seizures. The initial (and secondary) injuries occured to the occiptal region of my brain. I’ve told my neurologist about this (via an email through her office staff), and she didn’t seem overly concerned. Are you taking any aspirin or any other medicines or herbs? Sometimes this can be the cause. Does the sub conj heme happen after you have a seizure?? This can also contribute. There are many causes of red eye – sometimes they can be from an infection or inflammation and other times they can be a side effect of medication like coumadin and/or aspirin. I would advise you to go to see your eye doctor as soon as possible to have your condition properly diagnosed and treated. My son had this kind of eye redness 2 years ago and the doctor gave no medication because she said it would heal by itself. The doctor also said that the chlorine in the swimming pool that we visited a day before actually had an effect on my child’s eye condition. 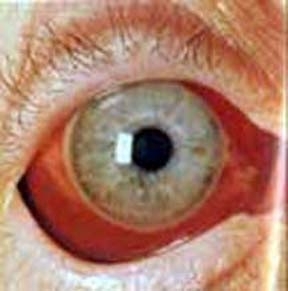 I notice a similar situation with a spot of blood (visible enough; about1-3mm) in my right eye. I have been on ALeve for about 2 months now due to some unexplained chest and back pain which radiates to my neck and the entire thoracic cage. It is very important that you go to see an eye doctor so you can be properly diagnosed and treated for your problem. Make sure you tell the doctor that you have been taking Aleve for 2 months – this may be significant in your diagnosis.